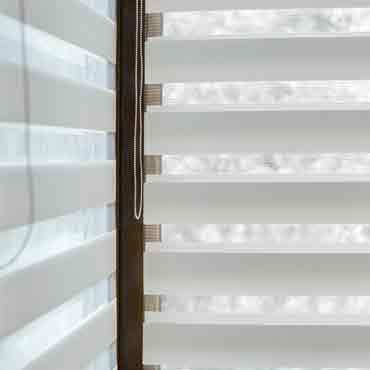 Sheer window shadings work like a wood blind and a cellular shade in one. It filters the light and provides complete privacy much like a cellular blind. These soft window shadings have fabric vanes that can be tilted open like a wood blind to open the view to the outside through the sheer fabric. The soft, adjustable fabric vanes are suspended between two sheer fabric facings going beyond traditional shades with an infinite range of light filtration.